Our final baby-related class is o-v-e-r, which means the waiting game has officially begun! 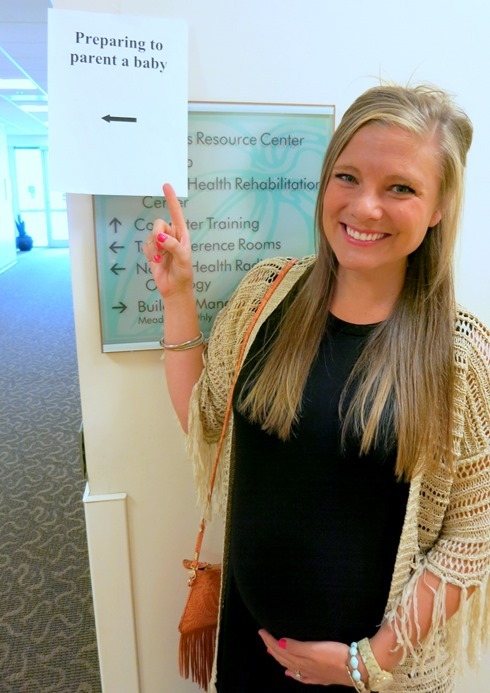 When I entered my third trimester, my OB/GYN recommended a series of classes for first-time parents and the one Ryan and I were most looking forward to was Saturday’s Preparing to Parent a Baby class. It can be so easy to get completely wrapped up in pregnancy and childbirth, but as my due date approaches and we start thinking more and more about what happens after we bring our baby home, it’s hard not to feel a bit overwhelmed about the next phase of this journey! 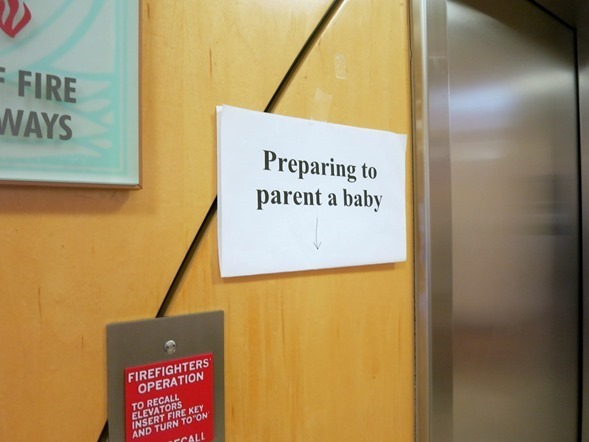 Preparing to Parent a Baby seemed like a good way to learn some of the basics and find out what we can expect during those first few weeks. The class took place from 9:30 a.m. to noon and our instructor was actually the same nurse who led our Childbirth Prep class two weeks ago. 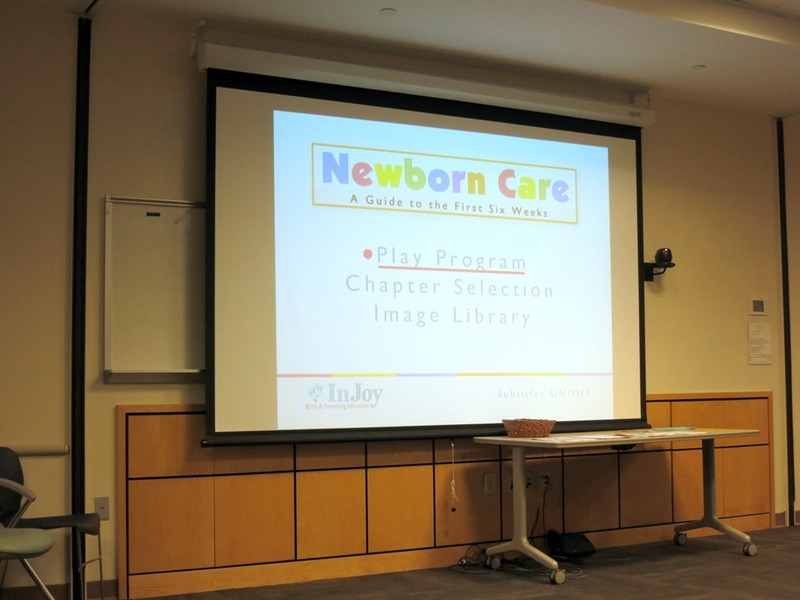 She began the class by playing a video that centered around caring for a newborn. 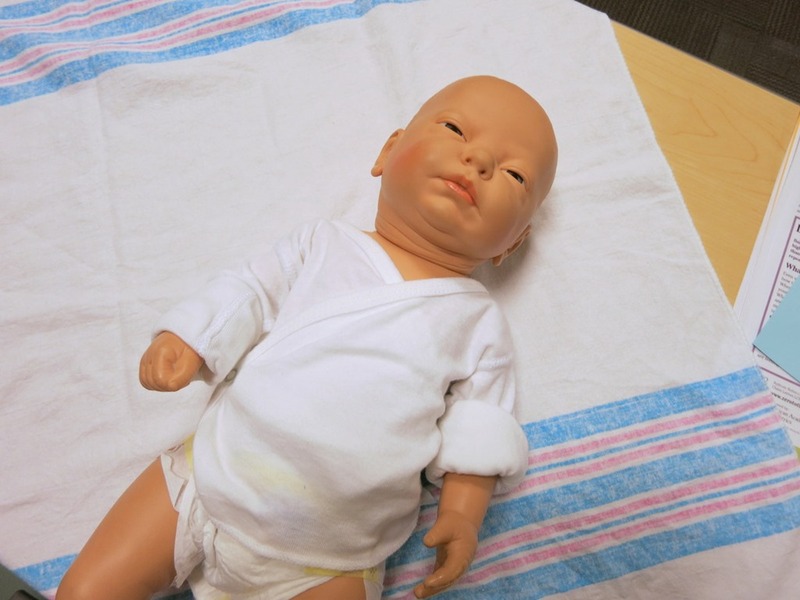 It touched on important topics like sleep, feeding and soothing your baby. Then it was time for a video featuring Dr. Harvey Karp, the doctor behind The Happiest Baby On the Block, a book I previously purchased thanks to a bunch of recommendations from new moms who swear by his advice. The video covered a lot of what I read in his book, but it was a great refresher and very helpful to see his tips and tricks put into action. Had we not watched the video, I would’ve had no idea just how loudly you’re supposed to make the “shhhh-ing” noise Dr. Karp says soothes babies and reminds them of the noises they heard in the mother’s womb. It’s pretty darn loud! Before we were done for the day, we took some time to practice swaddling and diapering. 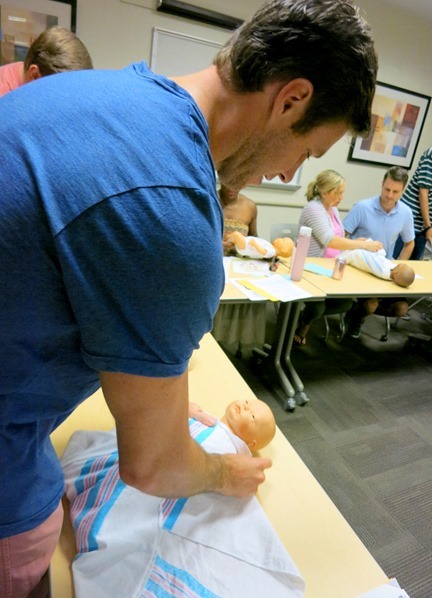 Ryan did a great job and we took turns practicing on our little mannequin baby. With our mannequin baby properly diapered and swaddled, we were free to go. We thanked our instructor and headed out to grab lunch and catch a matinee movie. We saw Trainwreck which was really funny but not quite as hysterical as I anticipated. Ryan and I are trying to take advantage of random last-minute dates before our little one arrives! Now that I’m at the end of my pregnancy, I feel like the advice I hear over and over again from everyone right now is to sleep as much as possible, go on dates with Ryan and relax! We took everyone’s advice to heart this weekend and had a wonderful time running around town, soaking up sun on the boat with Sadie and cleaning relaxing at home. I hope you had a great weekend, too!! Thank you!! <3 And awesome job on the DIY project this weekend... You're so darn handy!! I have three SwaddleMe wraps in my Amazon cart right now… I think it may be time to buy them! I was going to wait to see if I needed them, but so many people recommended them on my registry post that I’m thinking they’ll be very helpful! I remember that “baby watch!” time so clearly! We have twins so our “baby watch” started early and ended early as I was out on mostly bed rest beginning at 28 weeks and delivered at 34 weeks. There were scary times and visits to the hospital but I mostly remember feeling SO grateful for my husband and our care team and just general excitement. I hope you can enjoy this time with Ryan and the first few weeks as a family of three! I love that Ryan is so involved! You two are going to be great parents……..very very soon! So exciting! I felt much more prepared after I took that class! Then of course I didn’t remember much when i actually needed it but still haha! So exciting!! Definitely agree with the advice to relax and enjoy some dates in these last few weeks (or moments depending on timing!). We also saw about 6 movies (no joke) in the last two weeks before my son was born – we realized that every other time we went to the movies it would either be through hiring a babysitter or getting a family member to watch the baby – so either much more expensive or more unlikely to happen given that our family lives out of town and we want to spend time with them when they come to visit. The moment we realized that, we made plans to see pretty much every movie playing that we were interested in. So exciting! You are so close! I can’t imagine how excited you are. Have a great day! The 5 S’s worked so well for us! My husband was better at it than I was, lol. Also, here is a video of a woman on Oprah that goes over the “secret language of babies”. Apparently newborns have 5 sounds they make for hungry, sleepy, etc. Definitely recommend watching, we watched it after our son was born and we could identify some of the cries! Ooh thanks for sharing this!! I took myself to the movies last week for the first time since college and saw Trainwreck. Felt the same way not as hysterical. Enjoy the next few weeks with Ryan and Sadie! I was pretty underwhelmed by Trainwreck. I was expecting Bridesmaids-level hilarity. I’m not sure Amy Schumer can deliver quite as well as Kristin Wiig. That’s awesome they offer a class like that! My husband and I want to have kids in the near future and I know I’d be a little apprehensive about things like swaddling, how a baby should sleep in their crib, etc. My husband’s never even changed a diaper before so this class will def be beneficial!!!! And that’s funny you remarked on how loud the Shhhhh should be – When my sister had her first son she would vacuum while he was napping and I was amazed he wouldn’t fuss or wake up. Same reason – she said it was very similar to the noise babies hear in the womb. Crazy! They said hairdryers are often soothing to babies, too! I was so surprised! White noise machines work wonders. We bring ours when we travel anywhere since it’s something that she’s used to, and it’s honestly just as much for us as for her (so we can talk at a normal level and not worry about waking her up). I just ordered one last week after so many people said they’re great on my registry post! Glad it works well for you! Our hospital and pediatrician both provided us with free halo sleep sacks for swaddling. See if your hospital offers them because we didn’t need to buy them! However, we also have the summer infant swaddlers that are smaller and I like those for the evening. As for the “Ssshhing,” I read Happiest Baby on the Block and knew it had to be loud but quickly discovered just how comically loud it needs to be. Last night it simultaneously woke my husband up and put my baby to sleep! Enjoy these last days of pregnancy (as much as one can enjoy being nine months pregnant!). Exactly!! I knew it was supposed to be loud, but WOW! It’s like a whisper-scream! Ha! My baby hated to be swaddled. Not all babies love this. The class also emphasized that all babies are so different and like different things. Definitely good to keep in mind!! I never took a baby class before our son was born, but thankfully between instinct, Google, and the wonderful postpartum nurses, I figured it out. My son came 38 weeks 4 days, so you never know! But definitely trust your gut. I KNEW my son would be earlier than his due date. Such an exciting time! I’m looking forward to continuing to read along in your journey! And I found the best blankets for swaddling are Aden+Anis. They are amazing, so big I even used them for nursing covers. I cannot wait to hear about your birth story!! Good luck!!! My husband and I are doing our parenting/birth classes next week and I’m really excited to learn as much as possible. I have never swaddled, changed a diaper, or been around a newborn, so I’m a bit nervous about everything. Hopefully the class will ease my anxieties and help me feel more prepared. I can’t believe how CLOSE you are getting. It could really happen any day now!!! Do you and Ryan have a plan for when you start getting the “real” contractions? Is his work close by so that he can get home quickly to take you to the hospital? Any day now!! We are taking a Newborn Care class in about a month and I’m hoping it covers swaddling! Holy cannoli! Didn’t you JUST announce your pregnancy? You look absolutely glowing. As you say, enjoy these (hopefully) last 2 weeks as a couple. Side note: I love those ubiquitous hospital swaddling blankets. We swiped a bunch and I still (9 months later) use them (mostly when I pump at work). Done of the “5 S’s” did NOT work for us )hated swaddles) but we still calm our baby with the loud shhh-ing. Can’t wait for you to get my little goodie! I hope it helps too. If not, at least it will make you laugh. Can’t wait to hear when he’s made his debut! Congrats on being in the final part of your pregnancy! I’m new to your blog, do you know if your having a boy or girl? You’re almost there – so exciting!! I loved Dr. Karp’s book, those techniques worked so well for us, especially the swaddling and the white noise for sleeping! Hope you have everything packed and ready to go! With my daughter, I was so convinced she was going to be late that I still had a few things I was planning to finish up the weekend she was due. Instead, she decided to make her debut at 39 weeks and 4 days, and I ended up sitting on the bed telling my husband what to throw in my bag during contractions! Ahhh I am just so excited for you!!! you guys are so cute – what a fun class to take together. I am so excited for you both and cannot believe you are already about to have this little baby!! That class sounds awesome and SO HELPFUL, I wish they had offered something like that for us before Matilda was born. We were pretty much flying blind. So close! I’m sure you’ve heard it all, but my water broke at exactly 38 weeks. So you’re past that! 🙂 I’m a little jealous–I never got to the “come on, baby, get out now!” phase, and I felt a little unprepared when Marshall arrived early. I hope you’re feeling more ready now that the classes are done! I lived by the 5 S’s with my first and hope we have the same luck with our second, arriving this fall. On shushing, we loved the Baby Shusher (http://www.babyshusher.com) which we used primarily at night to get our son back to sleep after the multiple wake ups in addition to a white noise machine. You can also download the Shusher app on your iPhone for those seemingly all too frequent car rides turned meltdowns. Best of luck! So glad to hear that someone else was shocked how loud the “shhhh”ing was….my husband and I were both startled when the Dr. started! You never know! I had an appointment at 37+6 and was convinced our little one was snug and awaiting my scheduled induction 11 days later. Nope! She was born two days later at 38+1! Also,at this point, don’t text your husband “Guess what!? !” when it’s only about dinner plans and not baby time. I freaked him out! 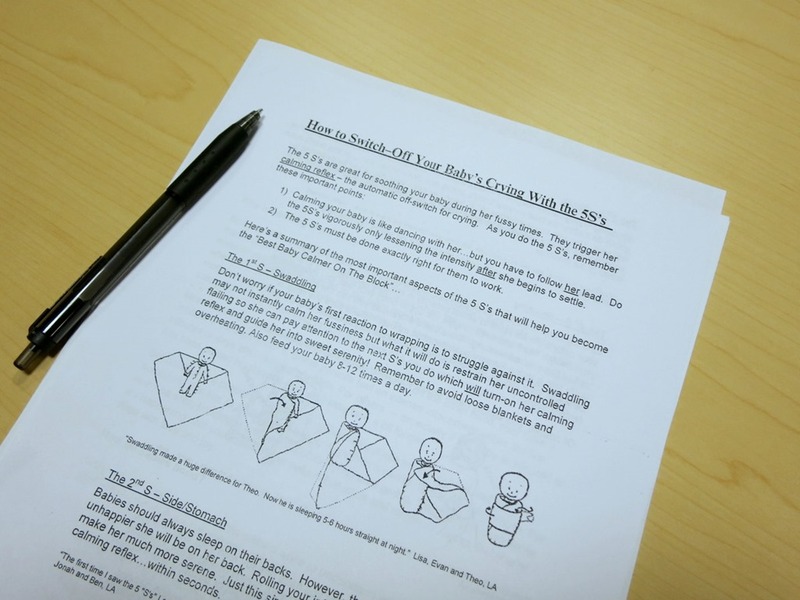 I’m so excited to start our childbirth classes! I also saw trainwreck over the weekend and was completely disappointed. You’re doing great! It seems like it would be great to have that class closer to the birth, so that all the info’s still fresh in your mind! Btw, I can tell that you’re more blonde in these pics (from that hair product that you mentioned works with the sun). So it’s not just your imagination! Cool product. I don’t post often but I had to say you look great for 38 weeks! I’ve followed your blog for many years and I’m excited for you and Ryan! It’s also nice to know they offer classes like you’re taking because my husband and I want kids but we are totally freaked out because neither of us have ever dealt with babies before! Here’s a tip that’s worked for both of my babies. When they’re fussy and you can’t muster any more SHHHHHHs, turn on the exhaust fan in the bathroom or the kitchen. In fact my husband is in the bathroom with my 3 week old right now. I second the date nights! My husband and I got pizza and saw Wolf of Wall Street when I was probably 38-39 weeks pregnant. Must have been quite a sight to see such a hugely pregnant lady watching such a raunchy movie. We laugh about it all the time now. We will certainly not forget that memory of one of our last nights as a family of 2! sounds like a very good idea to join the baby class program. very useful for people like me, a couple who just got married. so that everything is ready when the baby will be born. especially, knowledge and our skills as parents in caring for the baby is needed.